I’m a firm believer that proofreading is best done on printed paper. Not only do you miss a significant amount reading on screen, but I find that if I do overlook anything on the hard copy, I catch it when I start editing, i.e. it’s a sort of ‘belt and braces’ approach. Moreover, especially when I’m dealing with books or reports of more than 100 pages, I like to be able to flick through them, scribble notes, highlight things I need to check later etc., as opposed to scrolling up and down a screen and so on. Call me a Luddite, but it works best for me. So, pens are important to my work. You’d think any old pen would do, wouldn’t you? Well, if you’re as fussy as me – NO! 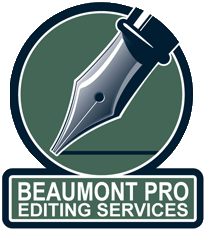 Firstly, I’ve found that for quicker editing down the line, bright colours are best, so the classic red and green, and sometimes purple, pink or turquoise. But, there’s red and then there’s red… I don’t want a light, orangey scarlet, or a namby-pamby pink – I want a vivid cherry or telephone box, true red. This is much more difficult to find than you might expect. Secondly, sometimes the proofs I work with are PDFs with very small and/or faint text, so a chunky old biro is no good (FYI: when they are, I don’t think you can go far wrong with the BiC Cristal medium). In these cases I need a very fine point, yet one that has a bold enough colour to stand out, has a nice smooth flow of ink and isn’t ‘scratchy’. Finally, I use decent quality Xerox 80g/m2 copier paper for printing out drafts but it’s still fairly thin, and because I usually print on both sides of the paper, I need a pen whose ink isn’t going to bleed through too much and make the other side of the page difficult to work with. For example, I’m a big fan of the uni-ball Eye Fine UB-157 rollerballs for most things, but there’s just a bit too much bleeding of the ink to do a large document with one on standard copier paper (ditto the Micro UB-150). I love ink pens, and they are going to get an honourable mention, not least as I like the idea of re-using a pen for years. 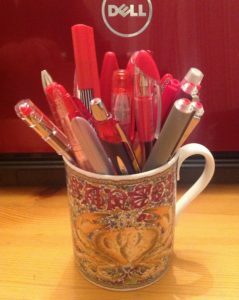 Once I’ve got through the 100+ pens in my possession, I shall probably whittle my collection down to 3-4 fountain/cartridge pens, a few uni-balls, and some trusted, carefully selected other pens. I should note that I’m left-handed, although I hold my pen in a ‘normal’ way, and don’t usually smudge. A few days’ editing later, a clear winner emerged, and an honourable runner up. 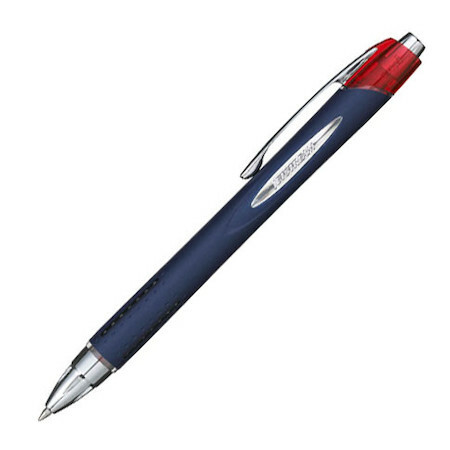 The top place went to the uni Jetstream RT SXN-217 Retractable Rollerball Pen Fine. It has a 0.7mm ball that writes with a 0.35mm line – and it writes like a dream: really deep red that glides over the paper effortlessly and dries fast, so no smudging. It’s also light and comfortable to grip. At £2.47, not the cheapest disposable pen (you can save money by buying a pack), but well worth it. Second was the Pilot Acroball Deluxe Ballpoint Fine. This has archival-quality ink, and was only marked slightly down because its red is a little less intense than the uni’s. Currently, only the Medium version is in stock; it’s only £2.50, and refills are available. In other colours, I loved the green and purple Pentel Slicci 04 Gel Rollerball, which writes with just a 0.2mm point. The green is a lovely, deep shade and still legible no matter how small you write, while the purple is a nice bright ‘true’ colour, too. Sometimes I proof PDFs with dark backgrounds, and like the uni-ball UM-120AC Signo Angelic Colour Pastel Gel Rollerball Pen for this, in white. The other pale colours have been discontinued, but I might try the Pilot G2 Pastel Retractable Gel Rollerball Pen in pink or yellow as an alternative. Last but not least, back to ink pens. I highly rate the Platinum Preppy Fountain Pens, which are such a bargain at just £2.79! I use the 02 Extra-Fine in red, and despite the size of the nib, it writes smoothly, and is only marked down slightly because the red is a bit feeble. The 03 Fine in green on the other hand is lovely, and fine enough to use on all but the smallest of print. If you want to invest in a good ink pen, I do own several more high-end ones, including a gorgeous Pelikan and a very reliable Stipula. For proofreading though, with some advice from the ever-patient staff at Cult Pens, I bought a TWSBI Eco Fountain Pen, in clear, with an extra-fine nib. For only £28.99, this is a wonderful pen, with an enormous ink cartridge so you’re not constantly refilling. It writes immediately, even if it hasn’t been used for a few days. Pair it with your favourite ink (I like Diamine’s Claret) and you’re good to go!